Our mom's been spending a lot of time this past month with a certain D-O-G. Yes, it's true. She's been cavorting in the snow with a...a...puppy. Disclaimer: our mom works for Hallmark, but she was not compensated in any way for this blog post. And even though we don't celebrate Christmas in our home, our mom works on a lot of Christmas products - and this is one of the coolest things she's seen. 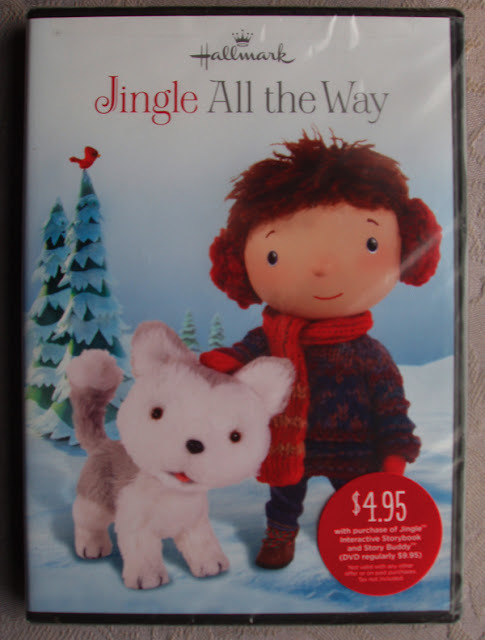 The technology that allows Jingle the plush toy to interact with the TV show, the book and the DVD is just too darned cool, and worth sharing. We have a DVD of Jingle to give away! The winner will be announced on Thursday, December 13, and the DVD will be rushed out so you can enjoy it for the holidays. UPDATE: we're sooo excited to discover we have three DVDs to give away! The winner will be announced in a post on Thursday December 13. Not USA but have a super Sunday. Awwww that looks so cute!!! That looks so cute. We don't blame your Mommy for playing with the puppy. My human wants to enter - she thinks it would make a great gift for her boyfriend's niece! that is adorable, maybe they do a cat one next year?? Aw, that's cute. I wasn't gonna enter until I read Sparkle's comment. We know a little human who might like it. We know a little girl who would like this! Thanks for the giveaway! BTW, our mom loves Hallmark cards. So cute! We would love to win. WAFFLES: Um, weed LOVE to win a DVD!!! Um, Is the grinch in it??? ...oh wait, the grinch is right here, and her name is K-A-T-I-E.
We'd like to join and give it to our US friends too. Weeeeeeeee!!!! Jingle. Hi all! The contest is over and the winners will be notified by email the morning of Thursday, 12/13!